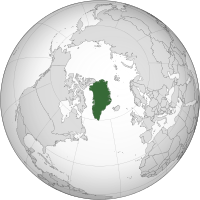 If you go North and East from the US or Canada, you will find a country called Greenland. It is an island, and the largest island on the Earth that is not considered a continent. This is mostly because almost all of Greenland is covered in a big sheet of ice!